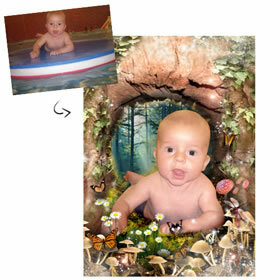 Turned an ordinary photo into a precious keepsake my daughter will treasure. Very quick turnaround. A wonderful service for a wonderful price. The picture turned out better than my wildest imagination! I couldn't have been more pleased. Service was VERY fast. From my initial inquiry until I received the final product (from the proof I approved), I waited less than 72 hours. My friends and family are very impressed with my finished product! The pictures have captured my children in a lovely 'family' group - it's so beautiful - I cried! The care and effort you put in to make the pictures right for me is much appreciated. Thanks again for being so willing to make the changes I requested and in such a quick timescale. 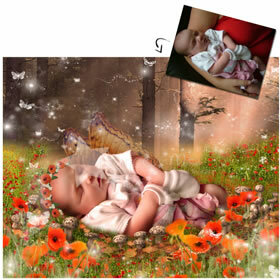 The enhanced photos I received were brilliant, they are really professional and beautiful. I am very happy with the results! 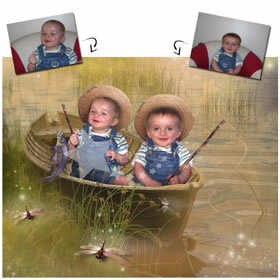 I was delighted to find www.enhance-me.com, what a fantastic way to create a unique keepsake of my little boys' picture, Excellent, speedy service and definitely value for money. I will be back with more pictures! It is amazing how someone can make a magical picture from a dull photo. The service was excellent, I was always kept well informed on what was going on and Victoria was very helpful. I was really pleased to find Enhance-Me as I had already used a similar service last year. It cost me a considerable amount of money and took almost 8 weeks from start to finish. My experience with Enhance Me was completely different! Fantastic service at a fantastic price. I am really pleased with the final product - it's a beautiful keepsake for my niece - and I am confident I will be coming back with more photos! Received photos this morning from Photobox, very very pleased. Many thanks for all your help. Excellent, professional service. Very helpful throughout and will definitely use again. I was more than pleased with my photo enhanced by Victoria, she was very patient with me as I kept changing my mind and I will definitely be using her service again! Many thanks Vicky. I can not recommend this service highly enough, it turns a "lovely" photo into a extraordinary one, and is such a beautiful and unique way to preserve those precious memories, topped with unbeatable customer service, you can't go wrong! The service I have received was super quick and excellent, the pictures I have ordered have been absolutely stunning! The price is very reasonable and I am really thrilled and would recommend that everyone has this done!!! Your work is out of this world & its amazing that you can see just what customers want! A treasure to keep forever - truly amazing! A genuinely nice lady who will cater everything to your needs. I would recommend her to anyone who wants professional photos for half the price and double the service. I'll definitely be coming back for more. Thank you again. A prompt, personal service which I would highly recommend to anyone, the detailing and work from enhance-me.com is of a very high standard and truly wonderful. This lady is truly amazing! She has transformed two separate pictures into a one beautiful picture which I will treasure forever. Best money ever spent! I cannot wait to get some more done. Well done you have true talent. I heard of Victoria Dixon through a baby site, and when I emailed her explaining I was not any good with pc's and printers etc she was more than happy to help me out. Instead of me having to struggle to print them off she printed them for me and posted them direct to my door all within a week. I was amazed how good they were and would recommend this lady to any one as the finished print was better than I could imagine. I'm so pleased with the pictures Victoria did for me!!!! They look amazing, can't wait to see my sisters face when she realises it's actually her in the pictures, they are so clever!!!! I was so pleased with the pictures and what Victoria had achieved from the pics given to her, as they are almost 30 years old. Can't wait to get some of my little girl done!!! Vicky was really friendly and even though she was very busy still got my picture to me very quickly. I am thrilled with the Noah's picture and everybody keeps asking where I got it from so I think she will be getting a lot of new customers. I found the service easy to use & e-mails are replied to quickly. I’m so pleased with my enhanced photo, I’m hoping to use it for my wedding invitations. I’d definitely recommend this service. The service was amazing, payment was quick easy and safe, the delivery of my finished product both swift and to a high standard. My whole experience with enhance-me.com was a pleasure. Victoria is a very talented woman, she totally transformed our dull photograph into something that was truly magnificent, it's made a wonderful unique gift for out friends and family. Vicky's imagination and talent shone through in a picture I had enhanced of my daughter. It turned a very plain photo into a magical wonderland. Thank you for your undivided attention to detail which was brilliantly priced and is now the talking point of visitors to our home. I was delighted with the wonderful image you produced and it made a great Fathers Day present. Thank you for the fast, friendly and very helpful service, I have recommended you to my friends. I have been delighted with the work Victoria has produced for me and will definitely be contacting her again. The pictures were completed quickly and to a fantastic standard. Nothing was too much trouble despite me being a very fussy customer. I can't recommend enhance-me highly enough, you will be amazed. Wonderful! Superb! Vicky helped to make our special occasion even more special and rememorable. She really captured the beauty and carefree style we were looking for! In the blink of an eye our children grow up ~ with enhance-me we get to capture a tiny moment and hold it forever. Thank you so very much! Fab quality, amazing prices, a genuinely nice lady. These photos made Abbeys birthday, she loves them! I was extremely happy with the service you provided and found you a very helpful and pleasant person to do business with. I am just saving some more pennies to try and get another one done as I love it so much! I have lots of comments on how unique it is and people asking me where they can get one! Hope to do business again in the near future. What a fantastic idea this is! I loved my pic before Vicky enhanced it but it now looks even more special. Absolutely brilliant service and Vicky is ever so friendly! We will be back for another pic very very soon. Keep up your fantastic work! I found the service you provided outstanding and very professional. Everyone has commented about how wonderful the prints are and what a fabulous job you have done. I always regretted not having the time to get a professional photograph taken of my little boys together when my youngest son was born at Christmas but when I stumbled across Vicky on Ebay I fell in love with her work and she made it possible to have that special photo! The result of her hard work and dedication is absolutely amazing! She made it EXACTLY how I asked but better and was happy to add a few of my personal requests, not the run of the mill photo editing, this was a masterpiece! I plan on using her service again in the near future and have told all my friends about it. Very good value for money as you can print as little or as many as you like at your own pace! Lovely lady to do business with, a fantastic person. How Enhance-Me can change an ordinary photo into something so spectacular is beyond me, such talent. Now I have a beautiful picture which I can treasure forever. The service is very fast and professional, and my family loved the results! To say I'm delighted with my photo is an understatement. It is exactly what I had in mind and I'm already looking for the next photo to enhance. It looks so professional; I couldn't have got a better result from hours in a photo studio. Truly magical! I was looking for something unusual and unique to give people as gifts and enhance-me was recommended to me. The service I got was really good, she was really friendly and helpful, I was given 100% until I was satisfied with the photo. I was also advised what pictures and backgrounds would look best for my photo. And when I received the final copy it was amazing how good the photo looked, it was really special. I would definitely use this service again and recommend it to a friend!! You did an amazing job making my daughter look like a true fairy!! I made her first birthday invitations using her enhanced photo and you wouldn't believe the compliments I received! Your work is amazing, and I will use your services again. Not only that, but I tell everyone about you. I searched a few websites before ordering, you were the most courteous and the best value. I cannot compliment on your work enough. Thank you again!! I couldn't have been more pleased with the professional, speedy, friendly service I received from enhance-me.com, and the end result was, well only two words for it really, SIMPLY STUNNING! Highly recommend to all. Vicky what an outstanding service, not only friendly and professional but quick to boot! I just adore seeing my little girl in such magical surroundings. Thanks so much for the enhancement and the time it took to do it. I just know my family and friends are going to love it on their Christmas cards. I ordered from Enhance-me and was utterly delighted with the end result. I was also very impressed by the compliance with my every request, however small the detail. I will be recommending and returning to enhance-me, no qualms! Thank you for such a fast and efficient service. What you've done with the pictures is just amazing. How easy to use and sorting out delivery of the print to me was a huge help in the run up to the big birthday. Fantastic present! I first heard about Enhance Me from a colleague at work, I logged on straight away and was really impressed with what I saw. I very quickly contacted Vicky and she very kindly guided me through the process of emailing her the pictures I wanted enhancing. By the next day Vicky sent me the first Enhancement and it was perfect. Both of my girls love fairies and anything to do with magic!! I explained this to Vicky and the picture was spot on. Everyone I have shown the picture to has asked me where I had it done, I will gladly recommend Enhance me to anybody . Vicky is absolutely amazing at listening to my ideas and making them a reality! I am obsessed with putting my daughter in fantasy scenes and Vicky has made each one truly unique. Beyond being an exceptionally nice person, she has a remarkable talent. I am almost tempted to keep her skills to myself, but that would be just too selfish of me! I encourage everyone to utilize her creativity. I was really happy with the service I received, good prices, good communication and the picture was gorgeous, prints received extremely quickly! A fast, friendly, lovely service, will recommend you to everyone I know with kids! 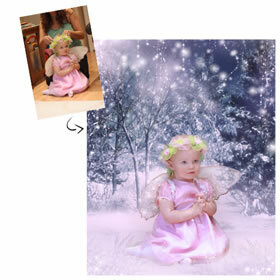 I contacted Vicky after looking through her online galleries to transform my daughter into a fairy for her 1st birthday. I had something very specific in mind and what she created far exceeded my expectations. The photo is magical and something that I will always cherish. The customer service Vicky provided was exceptional. I love what Vicky does with my picture's, they are so fantastic, She offer's a great service and communication is brilliant. She is always willing to change things if something isn't how you imagined it, but everything is always perfect. I have now had two picture's enhanced by Vicky and I shall keep coming back for more as my daughter grow's, I think they are a great keepsake and make brilliant presents. I was very impressed with the fast and friendly service I received from enhance -me.com. The photographs made a very unique present for Fathers Day, we've got so many photographs of the girls, it's lovely to have something a little bit different that they are also thrilled with. If only they were that angelic in real life! The whole process, from my original enquiry to the finished photos, took less than a week and was fantastic value for money. Thank you very much for a great service. the turn around from original pictures is amazing, will definitely be back again for more great work of yours. Always on hand to answer any questions and the proof was sent within hours. The kids love the picture. Keep up the great work. We couldn’t have been more delighted with the enhancements we received from Vicky. She was not only efficient and helpful but she was more than happy to put in the changes we requested - without any fuss. The end result turned an ordinary photo into an extraordinarily magical photo, one which we will take great pleasure in for years to come. Thank you. This is an excellent way to show your loved ones in a completely different light. I have received a very efficient and friendly service every step of the way, and I can not wait to use enhance me again! I am delighted with the personal and quick service that I received. Vicky worked to my idea and fulfilled it perfectly, resulting in a stunning, unique photo. What a FANTASTIC idea! I'm so pleased with my pictures, and the service you provided was first class. Not only are you very friendly but also you was quick to reply to my emails, and carried out my wishes perfectly. I will be recommending you to my friends. What enhance me provides it`s customers is a unique, professional and friendly service, nothing is too much trouble, and all the correspondence I sent was replied to immediately. My friends and family love the photo enhancement so much they are going to get them done. From the payment to producing the finished item, the service was very efficient, I hope other customers who visit enhance me are as delighted with the service they receive as I am. ABSOLUTELY SUPERB what a wonderful, fantastic service, quick, efficient and extremely friendly. Highly recommended, will make a lot of people very happy. Once again Vicky thank you very much our christmas cards will definitely be unique. I was overjoyed with the dedication and speed of your service. The enhancements were brilliant and I will definitely be coming back again. Friendly and quick communication during the process. Vicky was so easy to work with, and made sure we were 100% satisfied. We are more than impressed with our finish product! I cannot wait to show it off to friends and family at Christmas time!! I would highly recommend her to anyone!! What a talented woman! So much easier to get a portrait of four children smiling this way than going to a photographer and you can do as many prints as you like for no extra cost, like in a shop. The most adorable photo I've ever had done of my child!! The service was great - answered all questions / concerns courteously, took the time to make sure I was satisfied, and very fast production!! The photo itself is breathtaking!! I know that when I show my friends, they will want photos of their children done too!! I am so so so so happy with these photos, you have bought them alive in a way I never thought possible!! These will make the perfect christmas present for family and friends!! A truly incredible service, I will be back!!" As well as a prompt and professional service I received the most wonderful picture .......I was absolutely thrilled and delighted, its truly magical...! Who could ask for more? Thank you very much enhance-me.com. I was very pleased with the finished photos. The service was excellent and had a very fast turnaround. I found Vicky to be very helpful, friendly and extremely talented. I will be recommending her to friends and family and will definitely be back for more. I'll never be stuck for an original idea for a present again! The prints I ordered from Vicky at 'Enhance Me' went down a storm at my friends 50th birthday party - they were the talk of the night! My friend Jane loves the prints which show her with her idols - U2 - she couldn't believe her eyes!! Vicky's service was fast and the communication was great - you're dealing with a real person who cares about how the enhancements come out - not a faceless corporation. The prints were better than I dared to have hoped for - it looks like Jane was really there with them - I'll definitely be using Enhance Me again - it's such great value for money - I've recommended it to all my friends. Excellent, efficient and super speedy service. I’m really pleased with the finished picture of my son and daughter, it will make a lovely unique gift for the family. I will definitely be coming back for more! Highly recommended. I am delighted that I happened to find this website. Vicky was marvellous - the service was was very fast and I am absolutely thrilled and delighted with the end result. My baby niece looks so beautiful, everyone who has seen it has remarked how novel and beautiful it is. I'm sure it is a photo that my niece will come to treasure later in life. Vicky was in constant contact, she asked for my opinions and welcomed and acted upon my suggestions. I can't recommend this service strongly enough! Thank you for the customer-orientated and uncomplicated delivery of our photos in which we take much pleasure. Your enhancement is not only a marketing phrase but a substantial value added provided with creativity and quality. Not to forget the individual touch of your service! I was so happy when I found the enhance-me website and I thought that this would make a wonderful picture for us all to keep, especially as its my daughters first Christmas. I can't even described how wonderful my pictures turned out. Vicky was very accommodating and from the time I made my initial enquiry to receiving my proofs and then final pictures was so quick!! Thank you so much for these beautiful pictures and I will definitely be ordering more in the very near future. I’d heard at lot of good reviews for the enhancements so decided it would be worth a shot as the pictures would make a great extra in Christmas cards for family. I contact Vicky via email and she was always quick to respond and really helpful. After agreement on the service and payment had been made I only waited three days for my proofs and finals! I was absolutely amazed they were better than I had ever imagined. Amelia looks great surrounded by fairies!! It will make a great present for our family abroad and also a lovely keepsake for when she is older. I can’t thank Vicky enough. I will definitely be using her services again!! 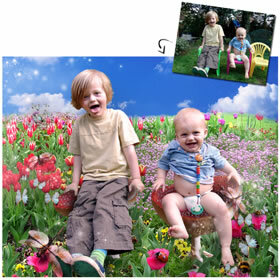 I have been looking to do something different with photographs of my boys for some time, and everything I found was expensive, and not always what I wanted, but thank goodness I found enhance-me.com, I am absolutely over the moon with the end result, and the helpful, fast and 100 % friendly service. A huge thank you, its perfect! I simply Can't recommend Vicky enough, she was so professional, my e-mail's were answered within hours, (sometimes mintues..!) She gave me so many different ideas, which I could choose from. The end product is beautiful, and I will most certainly use her again in the future, as will ALL my family and friends! I am delighted with the photos that Vicky has enhanced for me. Her response to my initial query was very prompt and I received the proofs far sooner than she had indicated that I would. Her communication has been very friendly and helpful and I would definitely use the service again. The photos that Vicky has made for me will be enjoyed for years to come. Wow what a wonderful picture! I have found the process of ordering very easy with great communication from Vicky. If you want your picture tweaked she has absolutely no worries with doing it. A very fast, reasonably priced and wonderful service, thank you. I can't recommend Vicky at Enhance-Me enough, she's very friendly and her service is first class. A very very quick service. The enhancement she made of my daughters was truely beautiful, and I will be coming back again and again. I'm a very happy customer indeed. The service I received was very quick, very professional and very very friendly! I am delighted with my enhance-me pictures and will be using Victoria's service again soon! Everyone who has seen my pictures have all gone off to order their own. Thank you for making my little girls into princesses! I was so pleased to come across this site. 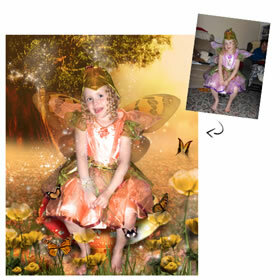 Vicky's work is fantastic she turned a precious picture of my little sister who sadly has passed away into a beautiful piece to treasure and created wonderful backgrounds for my sons pictures will be using enhance-me.com again. Her work is truly magical! I am extremely pleased with how my pictures turned out and amazed at how quickly and professionally the work was done. The service Vicky provides is fantastic and I will definitely use her again and recommend her to others. Such a beautiful picture and fast service! You have managed to turn 3 separate pictures of my girls into a gorgeous group photo. Many thanks!! Vicky, thank you so much for putting my two children in one beautiful picture! Excellent service and great communication! I am so happy with Victoria's amazing work. I found her website by chance and since ordering the adaption of the photo of my son I have recommended her to over 25 friends and family members. I was ecstatic with the final result and can't wait to share it with my family. I was delighted with the service I received from Vicky at enhance-me.com. I heard back within hours of making my enquiry and received my first draft within 24 hours! Vicky was friendly and professional and I was delighted with the results. I would recommend enhance-me.com to others and will definitely use them again for future enhancements. What a fantastic idea, great for gifts for Grandparents this Christmas. Fast, extremely professional service provided. and we are so happy with our picture! I'm sure we'll be back for more! I was impressed with the service I received from Vicky. She answered any questions I had and I was delighted with the end result as will my family be when they receive the pictures. 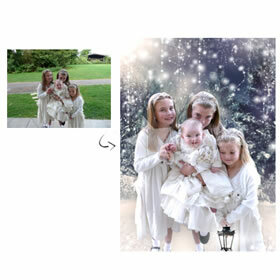 Vicky has done a fantastic job of creating a magical Christmas scene from two separate photos of my son and daughter. I love it! The service was very fast and professional throughout and Vicky was a pleasure to communicate with. I defy anyone not to love what this lady does! Thanks again Vicky! This service is truly AMAZING! It has allowed me to see my little girl in a new and magical light! Highly recommend it to one and all! I can't wait until Christmas to surprise my family with the gorgeous photos Vicky enhanced for me. She was fast (amazingly so) and within a week I had two beautiful photos my family will always treasure. It's the perfect way to add a little whimsy to any photo - and surprisingly affordable. 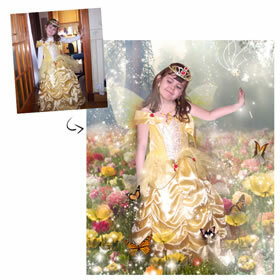 I was very impressed by the service and quality offered by enhance me who turned my daughter into a beautiful fairy!! Both sets of Grandparents will be overwhelmed with their Christmas gift, they always knew she was special but now we have the proof!! Top quality and prompt service received the whole way through, I'm already recommending the site to all my friends!! Vicky and her work are amazing, she really is a true professional, I am not much of a pc whizz and she helped me with everything I needed to know step by step, she is very patient and very thorough! Her responses to not only my never-ending questions but also on sending me the proofs and finished products of pictures was very very quick, i'm astounded!! She was happy to amend things for me with no fuss to give me exactly what I wanted! 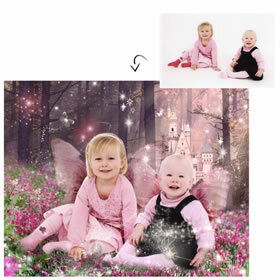 I can't wait to see my friends face when she unwraps a beautiful picture of her son enhanced by Vicky and I also LOVE the one of my daughter and will be framing one for her nanny too! I have purchased two pictures from Vicky and will definitely be coming back for more and recommending her and her professional service to all I know! I waited until the last minute deciding if I wanted an enhance-me photo done for Christmas and I am sure glad I chose to get one done. What a fab job, my little boy looks fantastic, your service is incredibly fast and you’re super friendly as well. I have no problems recommending you to anyone who will listen! COPYRIGHT NOTICE: I create my backgrounds myself using a number of photographs I have either taken myself or have found on free for commercial use Stock Photography sites. I also purchase the rights to some of the graphics I use. 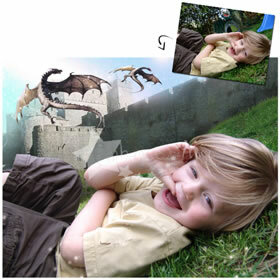 When you purchase an enhancement you are given the right to reprint the enhancement as often as you like on whatever media or in whatever format you want to. However, you cannot alter or add to the completed enhancement and claim the work as your own.